We have had the Android M developer previewed flashed on a Nexus 5 for all of five minutes, but we are already noticing fun little tweaks that Google has made since Lollipop. For one, the bright white settings menu on stock Android has been given a “dark” theme, for those not wanting to be blinded at night when doing some dirty work on their phones. If you unlock the developer options, you should see an option for “Theme” listed. 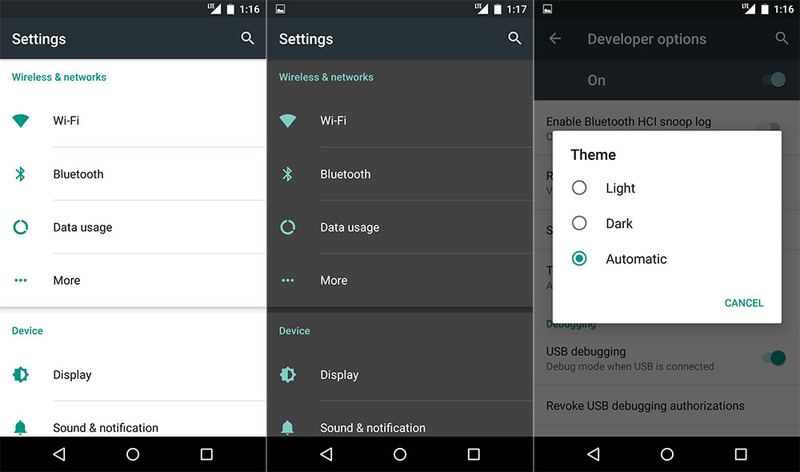 When tapped, you will see options for both “Light” and “Dark” themes, as well as an “Automatic” setting. As you can see in the screenshots above, the dark theme is indeed just a dark version of the light theme you have become accustomed to since Lollipop dropped. As for the “Automatic” setting, I would imagine that with this enabled, your phone will try and detect your situation, to decide if you would rather have dark over light or light over dark. We tried to get it to switch by going into a dark room here in our hotel, but were unsuccessful. If we get it to switch automatically, we’ll be sure to update this post. What do you think, though, themes in Android M? I’ll take it!